Will.i.am segues from music to wearable tech with "Puls"
Grammy-award winning musician will.i.am is on a different kind of tour these days. His latest venture is wearable tech, and he's just unveiled the "Puls," a sleek tech cuff device that makes calls without syncing to a smartphone. At first glance, the device looks like a watch, but the Black Eyed Peas frontman and entrepreneur insists that his smart gadget is no such thing. Instead, his wearable tech product is a blend of fashion and innovation. He told CNET at the San Francisco Dreamforce conference that he entered the wearable space to introduce a non-tethered device to the market, with elements of fashion. Puls can store music and pictures on 16GB of space. The device also has 1GB of RAM, Wi-Fi, Bluetooth, a 3G radio, and GPS, and features a voice navigator system called "AneedA," which is operated by Nuance's an intelligent voice system. The device, which requires a data plan under AT&T in the U.S., also has a pedometer and an accelerometer for fitness tracking. A sleek interface provides a trendy way to make a call, email or text a friend, but it faces tough competition from Samsung's Gear S Watch and the Moto 360 which also lets users dial out. In addition, Apple's highly-anticipated Apple Watch is expected to be released early next year. 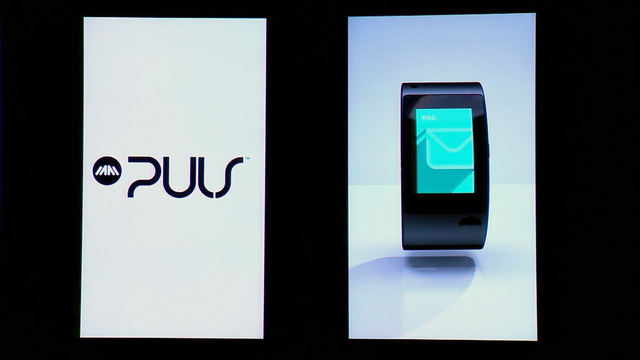 To amp up his Puls, will.i.am offers a fashion line which complements the gadget. A Power Wear jacket can be used to charge the cuff and extend its battery life through its sleeves, for example. This is not the artist's first foray into lifestyle tech. In 2012, he launched his i.am+ foto.sosho fashion camera accessory that turns iPhones into a point-and-shoot digital camera with on-board editing features and social media connectivity. He was also an early investor in Beats Electronics by fellow musician Dr. Dre. Beats, which produces a line of headphones, speakers and audio software, was acquired by Apple earlier this year for $3 billion. While will.i.am's biggest fans can register for pre-order information on the Puls, the price of the product remains a mystery for now. For more information, CNET has the full tech review on the gadget, which will be available in a variety of colors.